Two years ago, if you had told me I would one day be best friends with my daughter’s stepmom – I wouldn’t have believed you. If you had said we would be having dinner together, going on co-parenting dates, running a business, and living together – I would have called you crazy. A little over a year ago, when this blog first started, our family had just started co-parenting. After two years of not being able to be in the same room, never understanding each other’s side of the situation, fighting about everything, (and Stepmom hating my guts!) and believing there was no way we would ever get along – the four of us (Mom, Dad, Stepmom, and Stepdad) began developing our co-parenting relationship. Ultimately, this “co-parenting thing” would develop into a life-changing friendship. My ex husband and I had just negotiated a new custody order when Kristen and I started getting to know each other. Before, she had barely made it on my radar as anything more than “my ex’s girlfriend” then later, “my ex’s fiancé.” After they were engaged was when I realized – wow, she’s in it for the long haul. And while I was happy he found the one for him, I wasn’t as happy when I realized what that would mean for my daughter. As a mother whose entire world revolved around my little girl before the divorce, I had serious identity issues when it came to not being able to see her and mother her each and every day. It took me years to realize exactly why I was depressed beyond “missing my baby.” It was because every bit of who I had been when I was married revolved around being K’s mom. When my days with her were cut down to 2 a week, it felt like I was in mourning each and every moment I was without her. Then on top of trying to figure out who I was now as a mother, this new woman walks into the mix. Since getting to know Kristen and the kind of stepmom she is, she’s helped ease my fears of being “replaced””. She’s made it clear that she’s not here to replace Mom, but to supplement my role as mother when K is with her Dad. She also refuses to let K call her “Mom” which while many readers have been appalled by it, has actually helped me feel irreplaceable. K was so excited that day, it brought tears to my eyes. People think I’m weird for accepting my daughter’s stepmom as a fellow co-parent and mother figure. And to be honest, maybe they’re right. It is unusual, out of the norm, freaky, bizzare… It surprises every. single. person. who finds out. In reality, it was very hard for me to overcome that primal, territorial feeling known to mothers. Your first thought when someone else comes in the picture as a mom is “No way! That’s my daughter!” And watching Kristen with K, or hearing how she essentially is “Mom” at K’s dad’s house was really hard for me to get past. It took time and some serious internal work. But the real reason I accepted my daughter’s stepmom… was my daughter. Do you know how happy it makes her to see both her moms getting along? How giddy she’s been that she doesn’t have to choose sides? I took a step back after that day in the Wal-Mart parking lot and realized something. In the past, telling her I’ll miss her when she leaves left her running to the closet to hide at pick-up time. But getting excited about all the fun she would have with her dad or with Kristen actually made her happy. That was the only “real” reason I needed. After that, removing the conflict and getting to know Kristen was at the top of my to-do list. But the biggest turning point for our relationship was all thanks to K, herself. While my first instinct was to be jealous K was getting so close to her stepmom, I stopped myself. I remembered my promise to remove the conflict and make K happy – even if that meant talking all about Kristen. When Stepmom came to pick her up at transition time, K pushed her to tell me the whole story. To my surprise, Kristen opened up to me. She shared how she had been having trouble with the idea of being someone’s “second wife” which she equated with “second choice.” She confessed she had been jealous of me, and felt as though she was living my life. I was shocked. I remember being so surprised by her confession that I was brought to tears. After all this time of only focusing on how I felt as a mother, I never paused to wonder what it must feel like to be in her shoes. Suddenly, it felt as though a wall came tumbling down. After we talked she even asked to give me a hug. It was in that moment both our eyes were opened. From then on, Kristen and I began sharing pictures of K whenever she was with us. That little act of kindness really helped me feel at ease when K wasn’t with me. Although I couldn’t be with her while she was doing so many fun things with her dad and Kristen, it was calming to see how happy she was. The more we shared about K, the more we started sharing about ourselves and our experiences. We both had been so stuck in our own minds, overwhelmed with our own issues as a part of a not-so-blended family, it was like we were walking around with blinders on. Once we started talking and opening up, those blinders fell away and we realized how wrong we had been about each other. Our bond grew gradually, in a natural way, and left us both feeling cautiously optimistic about forming a real friendship. Then one day among our everyday conversation, I started opening up to Kristen about this blog (originally founded as Kandy Apple Mama). I shared all of the potential I felt it had as a platform, the things I wanted to accomplish with it, the obstacles I was facing running a business… and she seemed intrigued. I remember telling my husband how excited she was talking about it and wondered whether she might start her own blog. When he suggested I ask her to join me at Kandy Apple Mama, I never thought she’d go for it. Before I could even ask, Kristen offered to help! She asked if I had ever considered bringing on a business partner. I was shocked! (Was she reading my mind?) Of course I was more than willing, and the rest is history! We met up the very same day to talk blog and make a business plan. Going from co-parents to business partners has brought Kristen and I much closer than expected – we’ve become best friends! We are both so passionate about what we do that the hard work almost doesn’t feel like work (almost). Not only that, but it’s seriously improved our co-parenting relationship and forced us to work out our differences on hot-button topics we would have never otherwise discussed. Working on the blog together, doing the research, tackling the hard subjects no one else will, speaking with so many families in similar situations… It really drives home how important co-parenting is to us. Not just for parents wanting to escape conflict, but for the kids. Co-parenting with my daughter’s father, her stepmom, stepdad, and myself, has changed our daughter’s life in a way I never thought possible. She’s happy, loved, and excited to be in a blended family with so many people that care about her. The friendship that we, as her parents, have developed is icing on the cake! While running a blog and business partnership with your daughter’s stepmom might not sound ideal to most people, it’s actually a large part of what keeps the blog running. If Kristen hadn’t partnered with me, this business wouldn’t be where it’s at today, and I probably would have quit by now. It might sound cheesy, but I know this all happened for a reason. No relationship or friendship is perfect – including ours! But our relationship is more than co-parenting – we hold each other accountable, build each other up when we’re feeling down, and keep each other on track – in business, in life, and as mothers to the same little girl. PS: Thinking you don’t even know where to start? I totally get it! Keep in mind it all starts with communication. 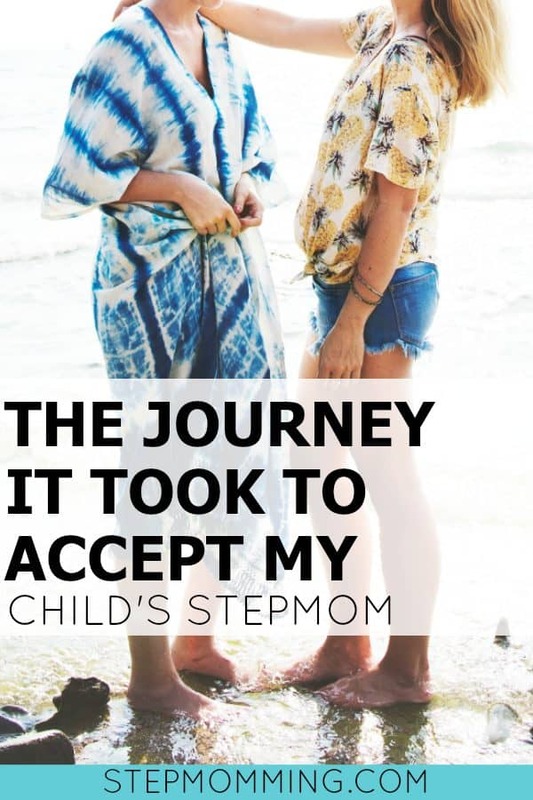 Check out the list of things I wish I could tell my child’s stepmom – and then do it! Sit down with her and talk things out. This is a great article. I wish everyone had this outlook. I have been a step parent for 10 years and I was the “dad’s girlfriend for 6 before that. I have been with my step kids since age 3 and 7. My stepdaughter and I are extremely close, however 16 years later she is now 19 and her mom still try’s to cause fights between us. At 19 my daughter can see that for herself sometimes but it would be nice if her mom would be happy her daughter has someone who loves her so much instead of what I perceive as being jealous. My stepson is 23 and had his first baby this year so just when I thought I crossed the finish line and didn’t have to see their mom anymore I realize I’m always going to have to deal with her. Any advice is welcome.